What are microbial volatile organic compounds? What physical and chemical characteristics of mVOCs are there? What is the tanimoto coefficient? What is "Add a new mVOC"? In mVOC you can find information about microbial volatile compounds. For each compound you will find a 2D as well as an interactive 3D structure. Another feature of our website is a similarity search tool with which you can search for similar mVOCs for your choosen compound. 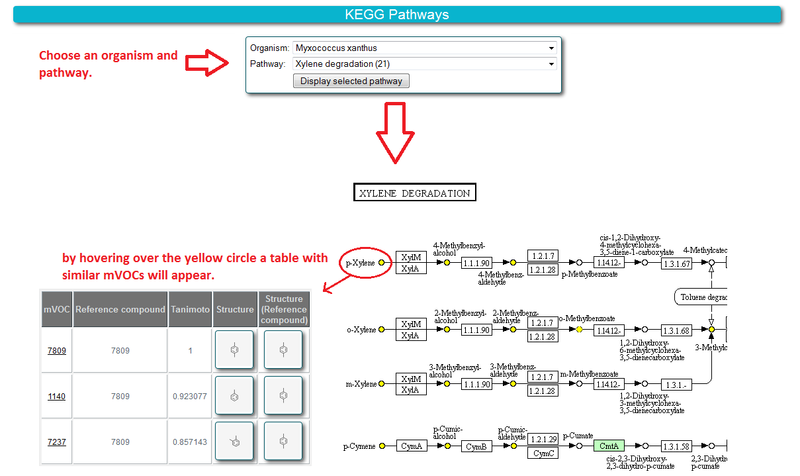 KEGG pathways can be shown for several bacterial and fungal species. mVOCs as well as similar compounds to mVOCs are highlighted in these pathways. Furthermore, we provide the possibility of adding mVOCs of your own by uploading a structure. If you use our database, please cite us. Thanks. We recommend a recent version of Mozilla Firefox, Microsoft Internet Explorer or Google Chrome. For the usage of the ChemDoodle web component Internet Explorer 9 or newer is recommended. 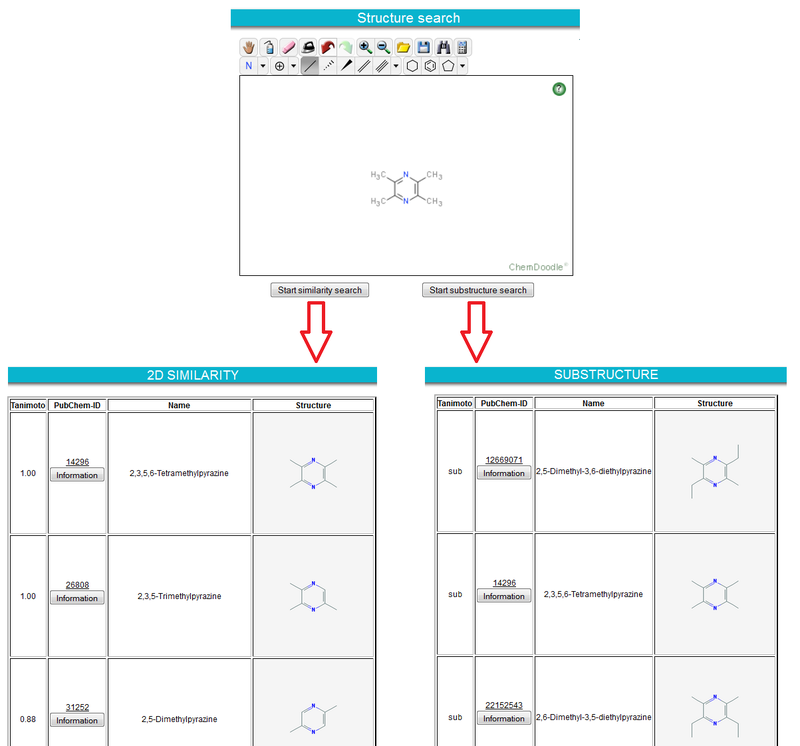 You find ChemDoodle implemented on the result pages for mVOC search for showing 3D structure of a mVOC, on the structure search page and on the add new mVOCs page. with heteroatoms and without heteroatoms. Also they affect the chemical and physical characteristics of the whole molecule. The moities are parts of a molecule including substructures of functional groups. For example, an ester functional group is divided into an alcohol and an acyl moiety. Determining for mVOC charcteristics is not the chemical reactivity but a poorly polar and a highly hydrophobic part of the molecule. The polar part is also called osmophoric group. Which consists of carbonyl-, ester-, hydroxyl-, or alcoxy-moieties as well as hetero aromatic analoges. Modifications of positions of functional groups or the allylsystem can lead to a loss of or modification of mVOCs. An InCHI ( IUPAC International Chemical Identifier) consists of characters which distinctly represent a chemical substance. It is designed in a way that a single compound produces always the same identifier. Therefore, IUPAC determines a nomenclature where InCHIs are created following three steps: Normalization; Canonicalization; Serialization. For more information about InCHIs: Visit this site. SMILES (Simplified Molcular Input Line Entry System) is a chemical language with which atom and bond symbols can be represented by using the ASCII characters. It is a unique string that can be used as a universal identifier for a specific chemical structure with which molecules or reactions can be symbolized. similarity measures like calculations and screenings. Whereas calculation is a quantify of similarity of two molecules. However screening is a way of eliminating molecules as candidates in a substructure search. The fingerprint algorithm examines the molecule and generates patterns of the atom. The output is a string of bits and is added to the fingerprint. For similarity screening of a compound against the mVOC database fingerprints of both molecules are used. Fragments of the molecules are assigned to set bits in the 1024 bit vector fingerprint. To compare the similarity between the compounds the tanimoto coefficient is applied. The tanimoto coefficient uses the bits set to one in both fingerprints. AB is the number of bits set to one in both molecules. A is the number of bits set to one in molecule A and B is the number of bits set to one in molecule B. The website gives you an insight of a database of mVOCS. You can search for mVOCs, search for a mVOC by its structure, browse the database, add a new mVOC or look for mVOCs in KEGG pathways at the appropriate buttons and their submenus. If you have any questions, which are not answered in the FAQs, please feel free to contact us! The mVOC Search gives an assortment of different types of queries. During the search about 1,000 compounds are screened. 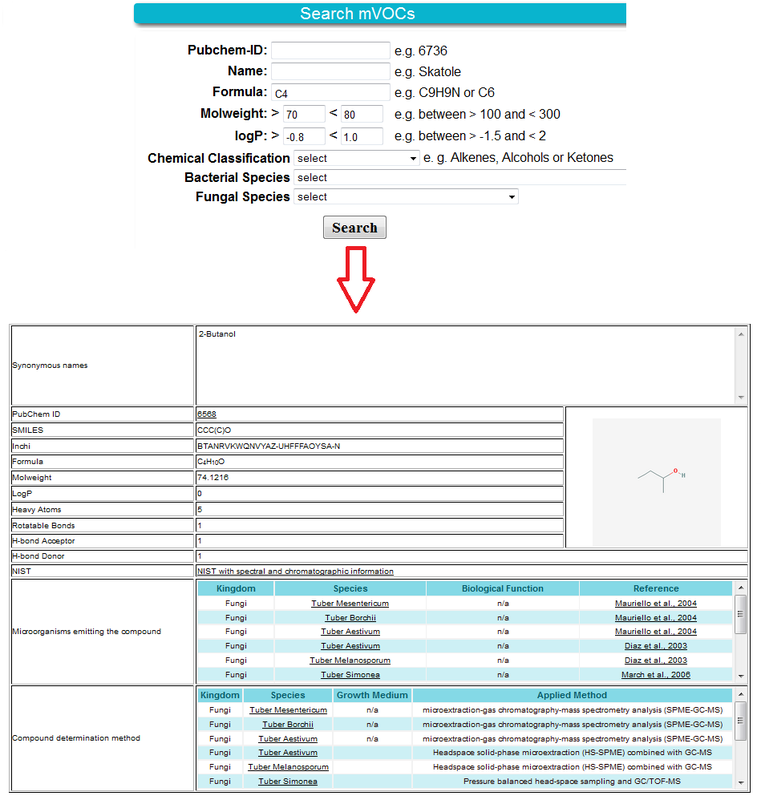 It is possible to search for only a name, formula or the PubChem ID of a compound. Another alternative is to search for compounds which have a similar molweight, logP or the same chemical classification. A combination of the parameters allows a more specific search. The result table shows the full information with synonyms, structural properties, the compound emitters, biological effect on other organisms as well as the reference which links you to the paper. See here a short movie about searching mVOC database. In the Structure Search you can build your own structure or upload a structure file. When starting the similarity search a table of compounds with similar structures is presented. Similar compounds are ranked by Tanimoto coefficient. Compounds with high Taminoto coefficient occur on the top of the table. Substructure search is also enabled. Here, the results appear also in a table showing structures having the drawed/uploaded compound as a part of their on. See here a short movie about searching mVOC database by structural similarity. Browse mVOC offers the possibility to browse the website by initial letters or chemical groups of all mVOCs included in mVOC database. By clicking on the respective initial letter or group a list showing mVOCs assigned to the group will appear. If you want to browse the mVOC database please click here. Signature tabels of a certain species serve for the identification of signature volatiles by showing the uniqueness of mVOCs by today's scientific knowledge. In the table, compounds are plotted which are emitted by the previously chosed bacterial or fungal species. Other species that emit those compounds are plotted against them. Signature tables are useful for distinguishing between species. Based on this, new possibilities for employing diagnostic tools can be considered. 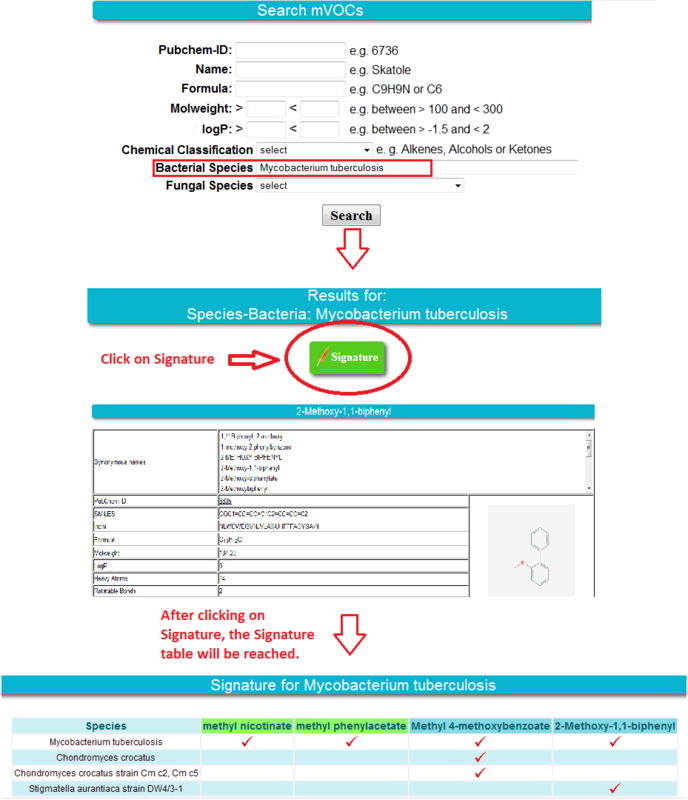 Signature tables can be reached by the Signatures button. Another possibility of reaching the tables is shown below in the picture. For biological interpretation KEGG pathways are included into the mVOC website. Compounds of mVOC database are mapped onto the KEGG pathways and highlighted in blue. Compounds similar to mVOCs contained in the database are also mapped onto the pathways and highlighted in yellow. See here a short movie about the usage of KEGG pathways starting with a structural similarity search. first: upload the structure via load a file, draw this structure or fill out the SMILES or InChI windows. thirtly: you fill out the misc information window providing references and name of the user together with the e-mail address.